NYC Ferry Celebrating 1 Million Rides Contest! *One entry per rider for the duration of the contest. 1. GENERAL: By entering this CONTEST (the “Contest”) and accepting the terms herein, entrants agree to be bound by the following rules (“Official Rules”), which hold a binding agreement between entrant and NYC Ferry (the “Sponsor”) and their respective parent companies, affiliates, subsidiaries, advertising and promotion agencies and all of their agents, officers, directors, shareholders, employees. These rules apply specifically to this Contest. This Contest is in no way sponsored, endorsed or administered by, or associated with any brands or corporations other than NYC Ferry. Any questions, comments or complaints regarding the promotion will be directed to the Sponsor. The Contest is subject to all federal, state and local laws and regulations and is void where prohibited by law. 2. ELIGIBILITY: This Contest is only open to all legal US residents (excluding Puerto Rico, the U.S. Virgin Islands and other territories and commonwealths) who are 21 years of age or older by start date for the Contest, as referenced below. NYC Ferry employees, and their respective immediate families (spouses, parents, children are not eligible to enter. By entering this Contest, entrant agrees to hold harmless Sponsor from any injury, loss, death, damage, action, claim or other liability that may occur from entrant’s participation in this Contest or acceptance of any prize awarded. 4. HOW TO ENTER: No purchase necessary for entry. Entrants may enter by completing the entry form available on the NYC Ferry Website (www.ferry.nyc/1M) by completing the available form. 5. INFORMATION COLLECTION: NYC Ferry will not transfer information of entrants to any third party. Contest is not open to minors under the age of 18 without expressed written consent of a parent or legal guardians. 7.PRIZES: All awards and prizes will be posted below per the specific Contest. All other costs and expenses which are not specifically listed as part of a prize in these Official Rules and which may be associated with the award, acceptance, receipt and use of all or any portion of the awarded prize are solely the responsibility of the respective prize winner. ALL FEDERAL, STATE AND LOCAL TAXES ASSOCIATED WITH THE RECEIPT OR USE OF ANY PRIZE ARE SOLELY THE RESPONSIBILITY OF THE WINNER. 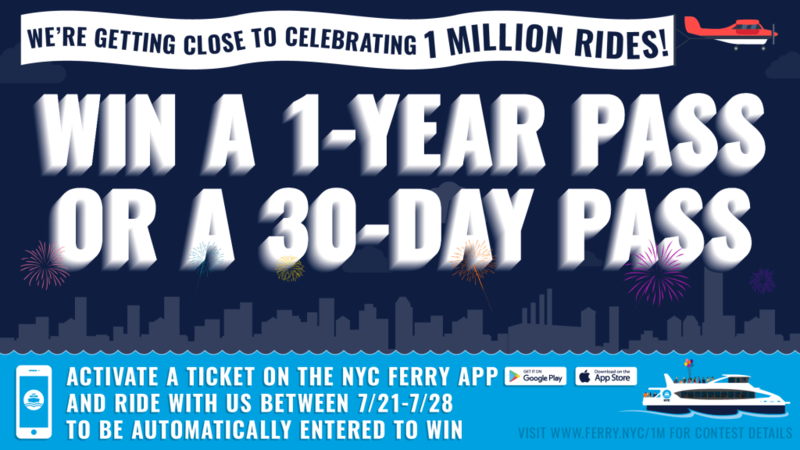 NYC Ferry 1 Million Rider Contest – Prize for one (1) winner is one (1) NYC Ferry Yearly Pass. Prize for ten (10) winners is one (1) 30-Day NYC Ferry Pass. 8. ADDITIONAL LIMITATIONS: Prizes and entries are non-transferable. No substitution or cash equivalent of prizes is permitted. Sponsor and its respective parent, affiliate and subsidiary companies, agents, and representatives are not responsible for any typographical or other errors in the offer or administration of the Contest, including, but not limited to, errors in any printing or posting of these Official Rules, the selection and announcement of any winner, or the distribution of any prize. Any attempt to damage the content or operation of this Contest is unlawful and subject to possible legal action by Sponsor. Sponsor reserves the right, at its sole discretion, to suspend, modify, abbreviate or terminate the Contest without further obligation. If Sponsor elects to abbreviate the Contest, Winner(s) will be determined from all eligible entries received for Drawing(s) prior to the action or compromise giving rise to the suspension or termination of this Contest. In the event of cancellation, abbreviation or suspension, Sponsor shall promptly post a notice on the Contest entry page to such effect. By participating, all entrants agree to abide by these Official Rules. 9. DISPUTES: Except where prohibited, entrant agrees that: (1) any and all disputes, claims and causes of action arising out of or connected with this Contest or any prize awarded shall be resolved individually, without resort to any form of class action, and exclusively by the appropriate United States District Court for New York or the appropriate New York State Court; (2) any and all claims, judgments and awards shall be limited to actual out-of-pocket costs incurred, including costs associated with entering this Contest, but in no event attorneys’ fees; and (3) under no circumstances will entrant be permitted to obtain awards for, and entrant hereby waives all rights to claim, indirect, punitive, incidental and consequential damages and any other damages, other than for actual out-of-pocket expenses, and any and all rights to have damages multiplied or otherwise increased. All issues and questions concerning the construction, validity, interpretation and enforceability of these Official Rules, or the rights and obligations of the entrant and Sponsor in connection with the Contest, shall be governed by, and construed in accordance with, the laws of the State of New York without giving effect to any choice of law or conflict of law rules (whether of the State of New York or any other jurisdiction), which would cause the application of the laws of any jurisdiction other than the State of New York. Any and all disputes that arise relating to the Contest must be filed within one (1) year from the date that the winner(s) is announced. 10. OFFICIAL RULES; LIST OF WINNERS: Entrants are held responsible for checking their respective emails for notifications of Contest results. For a copy of these Official Rules or the names of the winners, send a self-addressed, stamped envelope to: NYC Ferry, 110 Wall Street, New York, NY, 10005. Please allow 30-60 days for processing and delivery. 11. INDEMNIFICATION AND LIMITATION OF LIABILITY: BY ENTERING THE CONTEST, EACH ENTRANT AGREES TO INDEMNIFY, RELEASE AND HOLD HARMLESS SPONSOR AND ITS PARENT, AFFILIATE AND SUBSIDIARY COMPANIES, THE FACEBOOK PLATFORM, ADMINISTRATOR, ADVERTISING AND PROMOTIONAL AGENCIES, AND ALL THEIR RESPECTIVE OFFICERS, DIRECTORS, EMPLOYEES, REPRESENTATIVES AND AGENTS FROM ANY LIABILITY, DAMAGES, LOSSES OR INJURY RESULTING IN WHOLE OR IN PART, DIRECTLY OR INDIRECTLY, FROM THAT ENTRANT’S PARTICIPATION IN THE CONTEST AND THE ACCEPTANCE, USE OR MISUSE OF ANY PRIZE THAT MAY BE WON. SPONSOR AND ITS PARENT, AFFILIATE AND SUBSIDIARY COMPANIES DO NOT MAKE ANY WARRANTIES, EXPRESS OR IMPLIED, AS TO THE CONDITION, FITNESS OR MERCHANTABILITY OF THE PRIZE. SPONSOR AND ITS PARENTS, SUBSIDIARIES, AFFILIATES, ADVERTISING AND PROMOTIONAL AGENCIES, AND ALL THEIR RESPECTIVE OFFICERS, DIRECTORS, EMPLOYEES, REPRESENTATIVES AND AGENTS DISCLAIM ANY LIABILITY FOR DAMAGE TO ANY COMPUTER SYSTEM RESULTING FROM ACCESS TO OR THE DOWNLOAD OF INFORMATION OR MATERIALS CONNECTED WITH THE CONTEST. 12. RELEASE: By receipt of any prize, winners agree to release and hold harmless Sponsor and its respective subsidiaries, affiliates, suppliers, distributors, advertising/promotion agencies, and prize suppliers, and its parent companies and each such company’s officers, directors, employees and agents from and against any claim or cause of action, including, but not limited to, personal injury, death, or damage to or loss of property, arising out of participation in the Contest or receipt or use or misuse of any prize. 13. PUBLICITY: Participation in the Contest constitutes each entrant’s consent to Sponsor’s and its agents’ use of Entrant’s name, likeness, photograph, voice, opinions and/or hometown and state for promotional purposes in any media, worldwide, without further payment or consideration. 14. MISCELLANEOUS: Headings are provided for reference purposes only and will not be given any substantive effect. The failure to exercise or enforce any right or provision of these Official Rules shall not constitute a waiver of such right or provision. If any part of these Official Rules is held by a court of competent jurisdiction to be invalid or unenforceable, that part will be enforced to the maximum extent permitted by law, and the remainder of these Official Rules will remain fully in force.